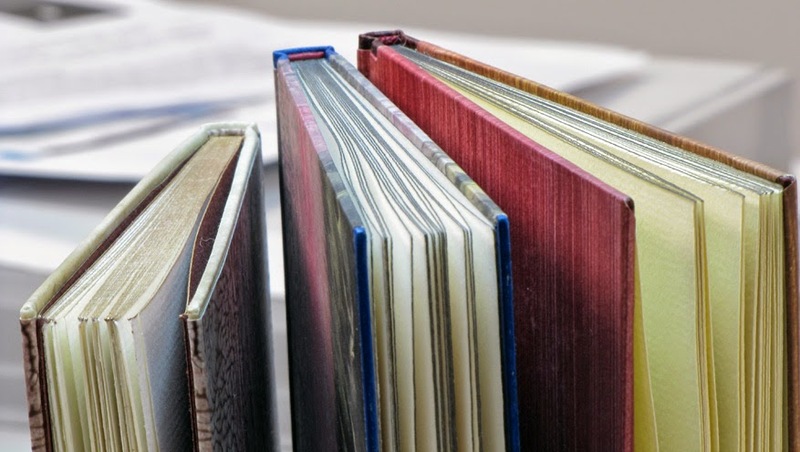 The German-style millimeter binding (Edelpappband) is the "ennobled" version of the paper-covered case binding and should not be confused with the equally elegant but fundamentally different Danish millimeter binding (link to John Hyltoft: Danish Millimeter Binding from GBW Standards 1995). 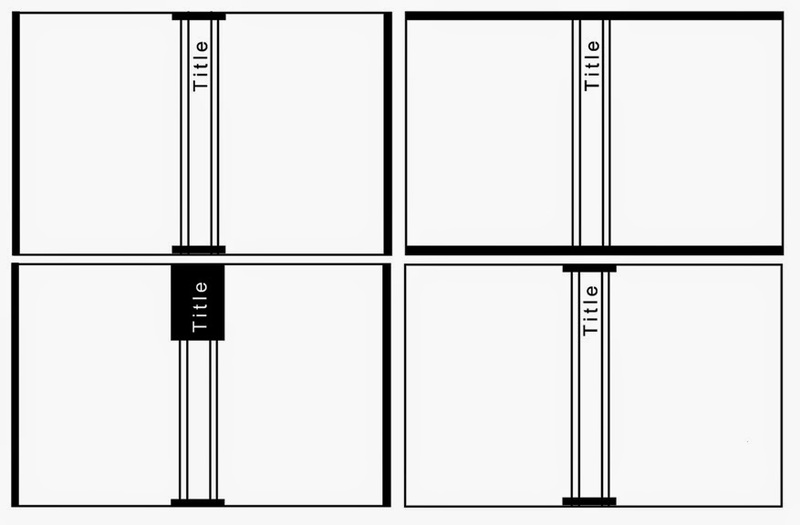 I described the case-bound German version of the millimeter binding in The Bonefolder, Volume 1, No. 2, Spring 2005, and Renate Mesmer the "in boards" version at the GBW Standards in 2005. Ernst Collin discussed aspects of this binding on "Wednesday" in his Pressbengel, link to the English Bone Folder at left. See also the 2005 Bonefolder Edelpappband / “Millimeter” Binding Bind-O-Rama where readers explored this structure, many for the first time. 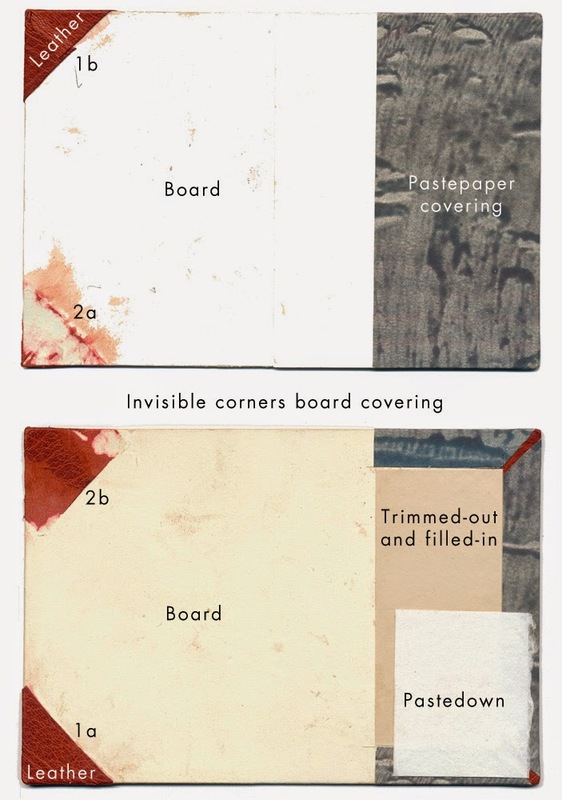 Below are some maquettes I made to illustrate the covering stages for the version with the narrow leather edge along top and bottom (or fore-edges) and the version with invisible corners. Below a diagram showing some of the design variants possible. The Enchiridon of Epictetus, Press Intermezzo, 1997. 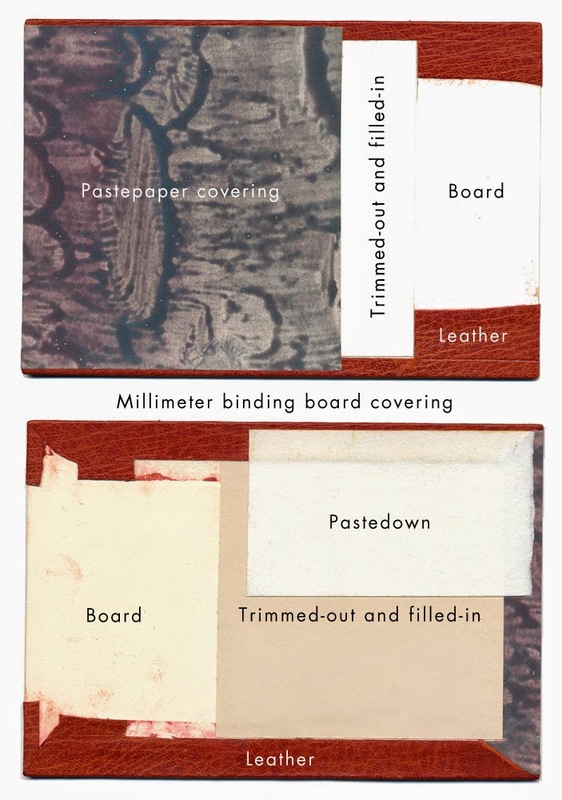 Edelpappband / millimeter binding: Endpapers of red Roma paper; top edge gilt; endband of pastepaper around thread core, vellum trim along top and bottom edges; covered in hand-made pastepaper; title in gold on front cover. 16.5 x 12 x 1cm. Bound 2005. Saturday Night, 1953 / The Elements, Angorfa Press, 1998. Edelpappband / millimeter binding: Sewn on 3 ramie tapes; plain endsheets same as text; solid graphite edges; red eel-skin leather endbands; "millimeter / edelpappband" case covered in original pastepaper by binder with blue eel-skin leather trim at head, tail, and along foreedges; title stamped in black on spine. 18 x 13 x .7cm. Bound 2003. 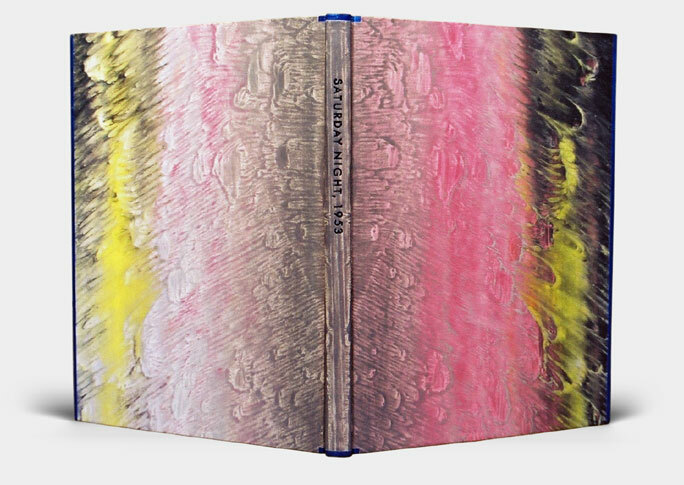 The book, in the "Cased Binding" category, was awarded the Harmatan Leather Award for Forwarding in the Society of Bookbinders' 2003 Bookbinding Competition. 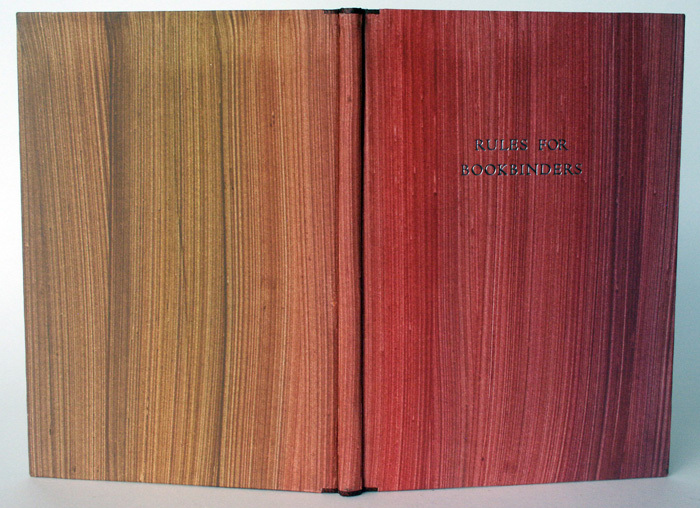 Fritz and Trudi Eberhardt, Rules for Bookbinders, The Boss Dog Press, 2003. Edelpappband / millimeter binding: Endpapers same as text; top edge in graphite and burnished; dark red leather endband around thread core; vellum trim at head/tail caps with invisible corners; covered in handmade pastepaper; title in graphite on front cover. Soft “Ascona-style” slipcase covered in paper to match book with title in graphite on spine. 18 x 12.5 x 1cm. Bound 2005. Other examples can be seen among the bindings here.